Lake Country HDO Foam Pads are specially designed foam pads that were developed for long-stroke dual action polishers. With the increasing popularity of long-stroke (also referred to as large throw) dual action polishers, the market demanded a line of foam pads designed specifically for these types of machines. After months of strenuous research and development, Lake Country is proud to introduce the HDO Foam Pads. Lake Country HDO Foam Pads feature a dual-density design. This unique design eliminates the concaving effect that other pads experience, allowing the pads to maintain optimum surface contact and extended usage on long-stroke machines, like the Rupes LHR 15ES “Big Foot” Random Orbital Polisher. Lake Country HDO Foam Pads will outlast and outperform any other foam pads on a long-stroke dual action polisher – guaranteed. 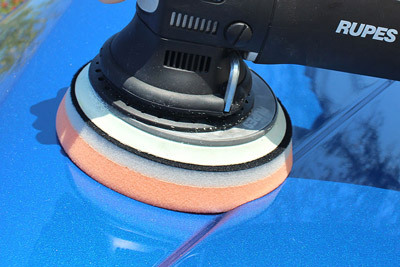 Features a microfiber nap that removes heavy imperfections from your painted surfaces. Like other microfiber pads, it will enough to remove moderate to severe paint imperfections, but finishes like a foam pad. Firm, medium density foam for scratch and defect removal. Use this pad with polishes and swirl removers. It’s an all around pad that will work on most light to moderate imperfections. Less dense foam formula for the application of cleaner waxes and light polishes. This pad has very light cutting power so it’s perfect for the removal of light defects and micro marring. Composition is firm enough to withstand added pressure during final finishing to remove buffer swirls. It has very little cut and will apply thin, even coats of waxes, sealants, and glazes, and ultra fine polishes. Super soft composition perfect for a flawless finish. With absolutely no cut, this pad will apply an even layer of thin, even coats of waxes, sealants, and ultra fine glazes and will buff to perfection. The engineers and product testers at Lake Country spent a great amount of time testing and re-testing various foam compositions and pad designs before they settled on what you see here. Every design aspect of the Lake Country HDO Foam Pads serves a purpose to improve longevity and performance. Lake Country HD Orbital Foam Pads feature an engineered bevel that prevents pad “rolling,” allowing the pad to stay flat on the surface. Keeping the pad flat on the surface is critical for pad rotation, because if the pad isn’t rotating, then it’s just vibrating on the surface instead of leveling it. Foam Construction – Because the pad is composed of several materials in addition to foam,, there is less foam movement which minimizes haze and micro marring. Lake Country 5.5 Inch HDO Foam Pads were designed for use with the Rupes LHR 15ES Big Foot Random Orbital Polisher, the Griot's Garage BOSS G15 Long-Throw Orbital Polisher, or other similar long throw polishers. The face of the Lake Country 5.5 inch HDO Foam Pad is 5.5 inches with a 5 inch backing. A 5 inch backing plate is recommended for best results. Rupes LHR 15ES Big Foot Random Orbital Polisher FREE SHIPPING!